PM Narendra Modi was addressing the BJP Parliamentary Party meeting, where he was greeted with the slogan, "Jeet hamari jari hai, ab Karnataka ki bari hai" (Our winning spree continues, now it's Karnataka's turn). New Delhi: Prime Minister Narendra Modi today dubbed the BJP's win over the Left in Tripura a "victory of ideology" and said the party needs to work hard to maintain its winning electoral streak, Parliamentary Affairs Minister Ananth Kumar told reporters. PM Modi was addressing the BJP Parliamentary Party meeting, where he was greeted with the slogan, "Jeet hamari jari hai, ab Karnataka ki bari hai" (Our winning spree continues, now it's Karnataka's turn). The prime minister spoke about the BJP's impressive performance in the the three northeast states of Tripura, Nagaland and Meghayala. 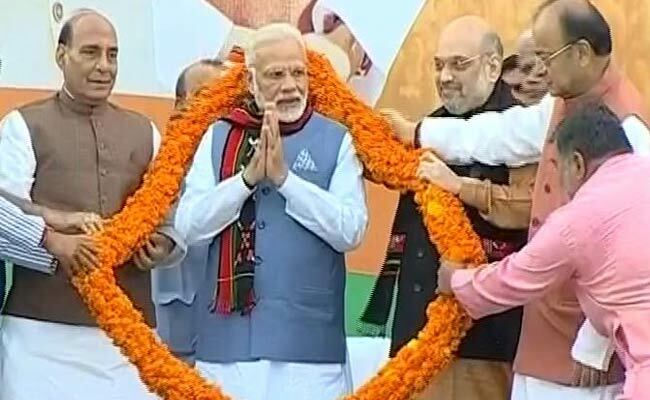 According to party leaders at the meeting, PM Modi referred to comments from some critics that Tripura was a small state with only two Lok Sabha seats and underlined the significance of the BJP's win. He said the state had long been yearning for change and people embraced it by ousting the Left which was in power for over 25 years. "Tripura was considered a bastion of Marxism for the last 25 years. This is an ideological victory," party leaders quoted PM Modi as saying. It is finished across the world and is on the verge of oblivion in India as it is now in power only in Kerala, Mr Kumar said, quoting PM Modi. An alliance of several parties, including the BJP, was sworn in Meghalaya today and PM Modi extended his greetings to new Chief Minister Conrad Sangma. With the Karnataka Assembly polls round the corner, PM Modi told the gathering that the party will need to work hard to maintain its winning streak and asserted that there was an atmosphere of hope and expectation in the country, Mr Kumar said. The prime minister asserted that the party should endeavour to live up to people's expectations as it rejoices in its electoral win and asked MPs to take to the masses details of the Union Budget that was aimed at building a new India. PM Modi also paid tribute to nine BJP workers, who were killed in alleged political violence in Tripura during the run up to the state polls.